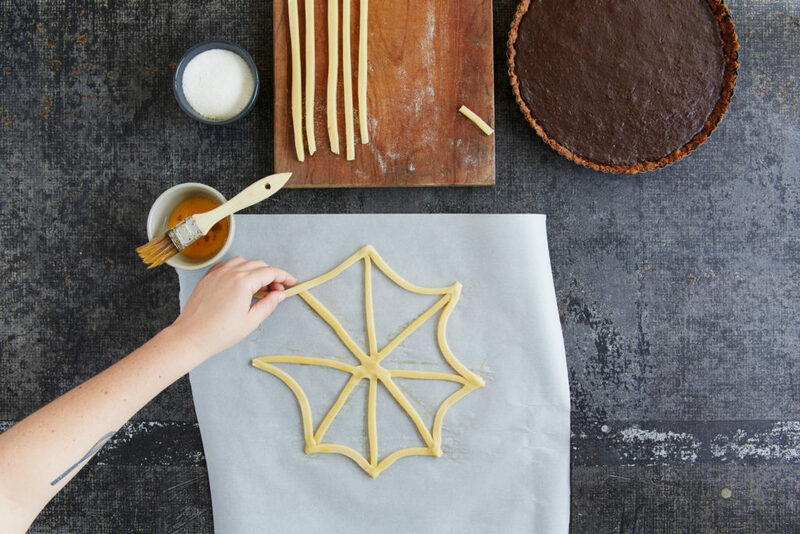 With this pastry spider web, a favorite pie or tart takes on a deliciously scary aspect. Looking for an easy treat for a spooky celebration? 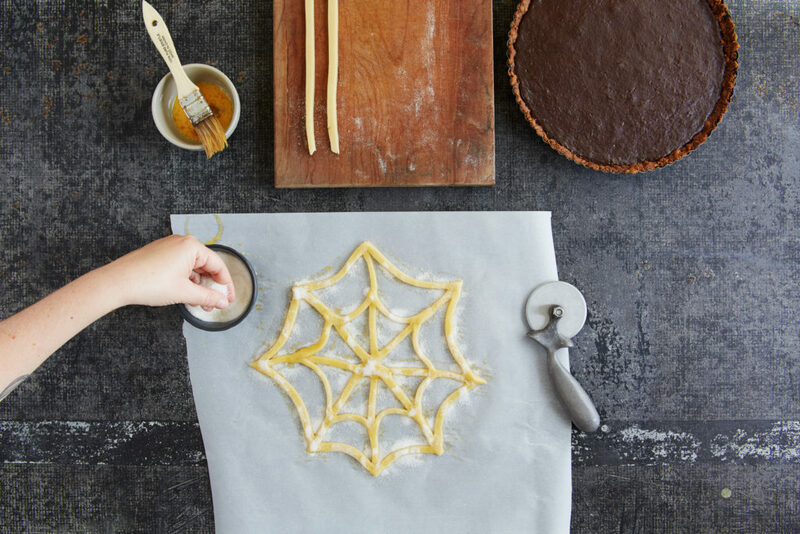 Bake your favorite single-crust pie or tart, then make a spider web topper with pie dough. The process is simple and the result is a deliciously scary, festive dessert. Chocolate Tart with Chocolate Chip Cookie Crust is a great tart for this project. The dark chocolate filling provides a great contrast to the pie dough topper. Pumpkin Pie or a green Grasshopper Pie are other excellent options. 3. 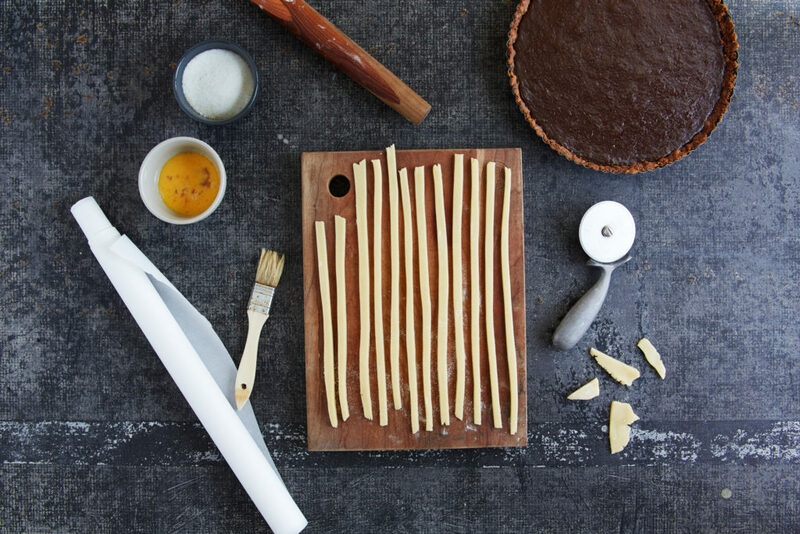 Add additional strips of dough, draping each between the sections of the outer edges to create the web-like pattern. Once outer section is completed, continue with a second web layer, placing it about half-way between center and outer layer of dough. Pinch together dough edges at each point and gently press dough at each intersection. Brush dough web with egg wash again, then transfer to the refrigerator and let chill for at least 30 minutes. Spider web can be refrigerated overnight, loosely covered after the egg wash has dried. 4. Preheat oven to 350°F. Brush finished dough web with egg wash one last time and sprinkle generously with sugar. Transfer parchment paper and dough web to a baking sheet, then move baking sheet to the oven and bake until dough is golden, 10-15 minutes. Remove and let cool completely. 5. Use a large offset spatula to gently loosen baked web from parchment paper. 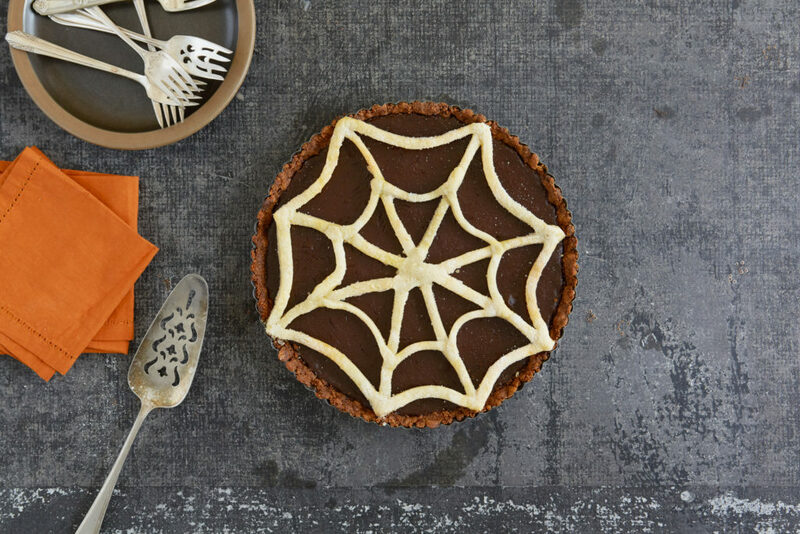 Carefully place web on top of prepared tart or pie. Add additional festive decoration as desired, then serve — and enjoy! This article was first published on the MarthaStewart.com Network on July 24, 2017. 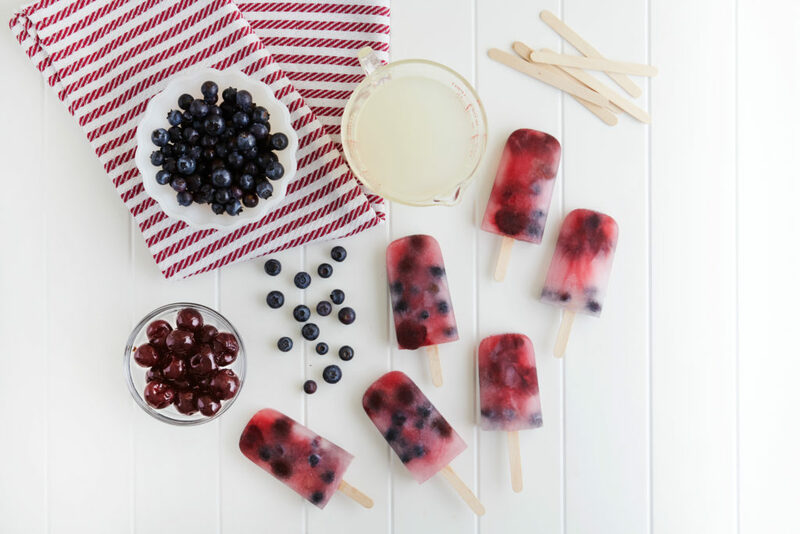 Chill out this summer with these easy, refreshing popsicles. Popsicles are the quintessential summer cool-down treat. They are certainly my go-to on a hot, sunny day. And while there are so many different flavor combinations you can easily try at home, sometimes going simple is good. Here are three very different popsicles you can make using just three ingredients. 1. No popsicle molds? No problem. You can use plastic or paper cups. 2. If you forgot to get wooden popsicle sticks don’t worry, you can use paper straws, wooden skewers, or even spoons. 3. Run warm water over popsicle molds to help release the popsicles after they are frozen. 4. Use a cupcake liner as a drip catcher. Simply poke a hole in the bottom and place it through the stick and under the popsicle. 5. If you want to take your popsicles out of the molds before you are ready to serve them, store them individually in plastic sandwich bags. Three summer-time staples frozen together for one deliciously refreshing ice-cold treat. Using the Classic Lemonade recipe makes these frozen desserts even better. Pour the lemonade into popsicle molds, filling about 3/4 full. Drop blueberries and pitted cherries into the molds (depending on the size of your molds, you may need to cut the cherries in half). Use a popsicle stick to push the fruit down into the lemonade. Transfer to the freezer and freeze until slushy, about 45 minutes. Insert popsicle sticks and continue freezing until completely solid. Watermelon agua fresca is one of my favorite summer time drinks. It’s absolutely delicious and completely refreshing. And turning it into an icy treat makes it even better. 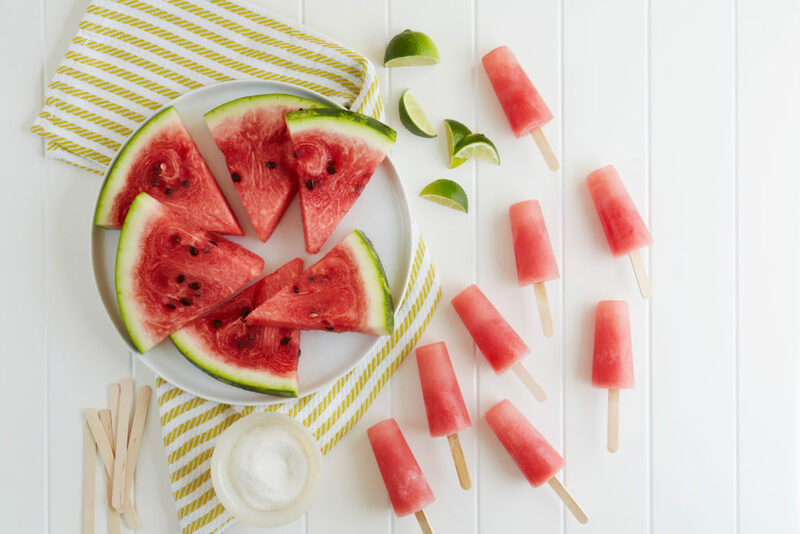 This Agua Fresca recipe with watermelon makes fabulous frozen pops. Pour it into popsicle molds. Transfer to the freezer and freeze until slushy, about 45 minutes. Insert popsicle sticks and continue freezing until completely solid. Smooth, creamy, and delicious, that’s banana ice cream and it is super easy to make. 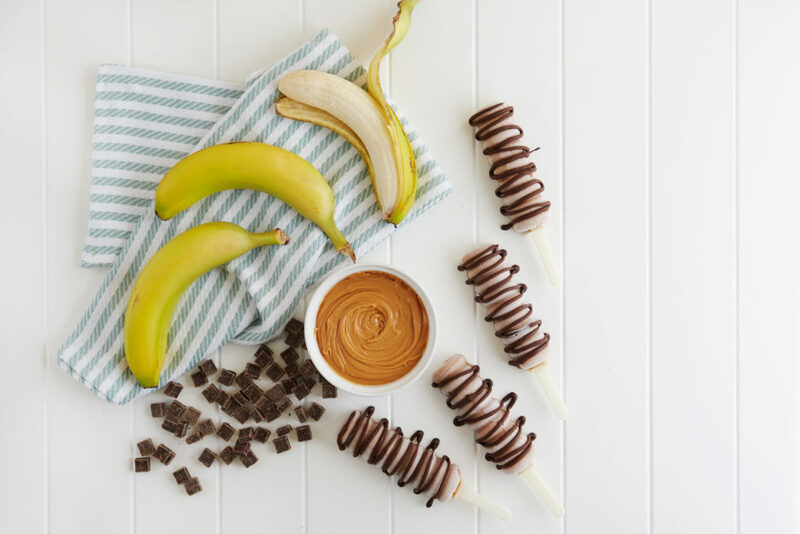 To prepare these creamy popsicles, follow the steps for Banana Ice Cream adding approximatley 3 tablespoons creamy peanut butter for every banana. Puree the bananas and peanut butter together in a food processor, then pour the mixture into popsicle molds. Insert popsicle sticks and freeze until solid. 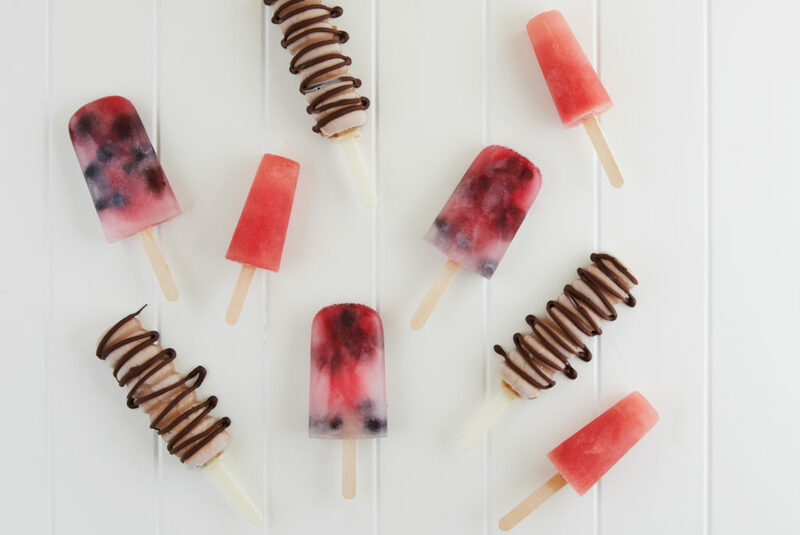 Remove the popsicles from the molds and drizzle on melted chocolate. Transfer to a parchment-lined baking sheet and freeze until the chocolate is set. For longer storage, transfer the popsicles to a freezer bag. This article was first published on the MarthaStewart.com Network on July 18, 2017. Here’s a genius hack that makes it easy to join the edible succulent craze. 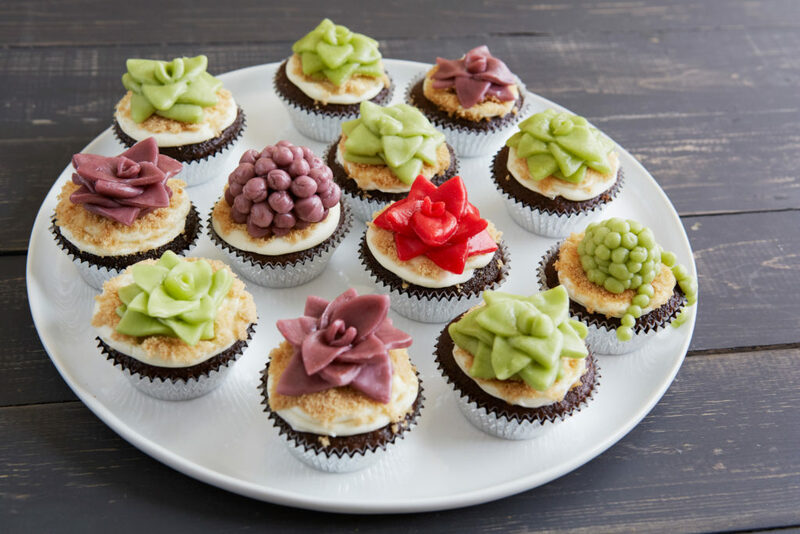 No fondant, gum paste, or special pastry tips are needed to top your cakes with fabulous edible succulent decorations. This inspired technique uses fruit chew candy! * Fruit chew candy comes many colors. I used green, purple and red since succulents are most often those colors. 1. Place 10 to 12 fruit chew candies, all the same color, on a small piece of parchment paper. Transfer to the microwave, heat for 20 seconds. The candy should be very soft and semi-melted together, but not completely liquid. If necessary, continue melting in the microwave in 5 second increments until the right consistency is reached. 3. Use the teardrop shaped cutter to cut “leaves” from the melted candy sheet. 4. 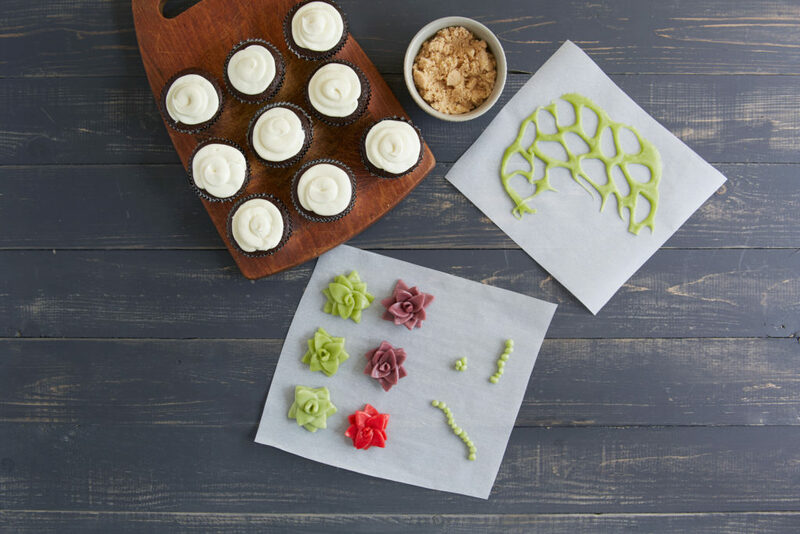 To assemble the candy succulents: Spread a clean sheet of parchment paper on a work surface. 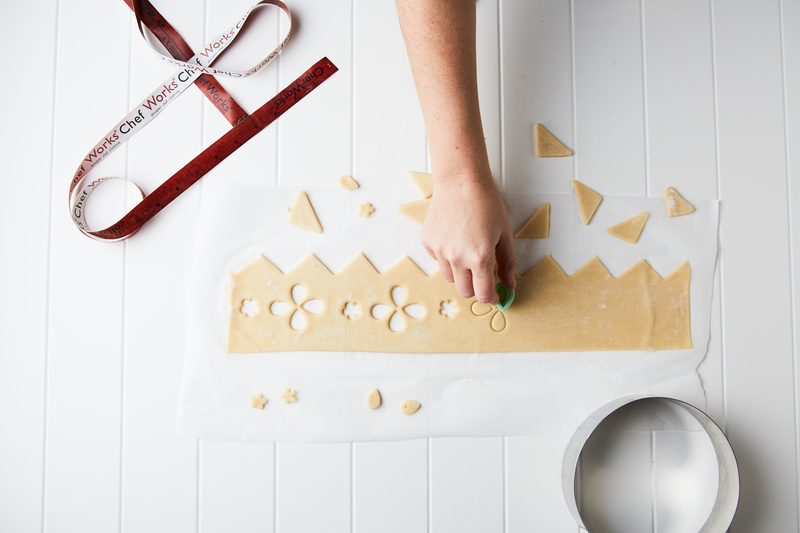 Place a leaf in the center of the parchment paper, with the pointed side facing up. Place a second leaf on top, in the same position, but slightly rotated to the right. Press the bottom of the rounded leaf bases into each other, which will naturally force the pointed end upward, causing the leaves to hold together. Continue adding leaves in a circular, spiraling pattern (think about the hands moving on a clock) until the succulent is the height you want. I used 10-12 leaves to make each of my candy succulents. The candy will harden as it cools and retain shape. If your melted candies get too hard to work with, soften them up in the microwave. Once a succulent is finished, transfer to the refrigerator until completely firm, 15 to 20 minutes. Repeat process with other colors of fruit chew candy. Tip: Save your scraps! Reuse scraps from your leaf cut-outs. Either fold them together, reheat, and re-roll them to make additional leaves or roll them into pea-sized balls to make a different style succulent decoration. 5. 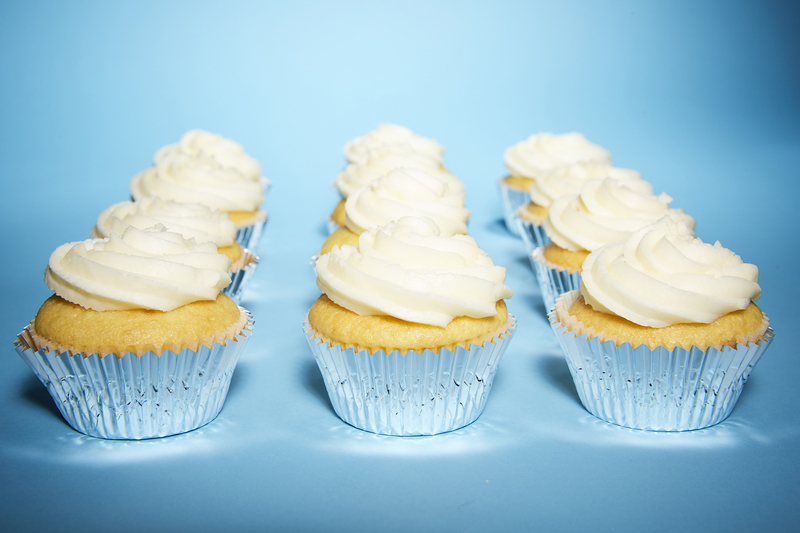 Sprinkle brown sugar or Turbinado sugar on top of the white icing on the cupcakes to create a sandlike effect. Place the finished candy succulents to on top. This article was first published on the MarthaStewart.com Network on May 24, 2017. 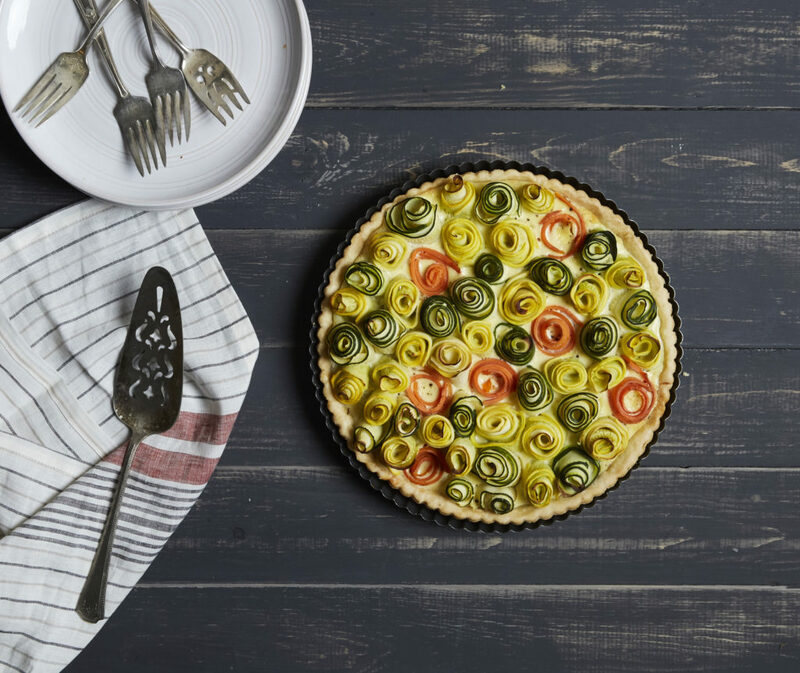 This Blooming Vegetable Quiche is the Most Beautiful Brunch Entree! Last year I made a Rose Apple Pie, using thinly sliced apples, rolled to look like roses. The result was a stunning — and delicious. It got me thinking about a savory version, using vegetables. This is the result, a blooming vegetable quiche. Each bite tastes as good as it looks! Prepare the pie dough as instructed. Once it’s ready, roll it out on a lightly floured surface. Then, transfer it to a 10-inch tart pan or shallow pie dish. Crimp the edges and prick the bottoms and sides with a fork. Cover with plastic wrap and refrigerate for 15 to 20 minutes. (Chilling the dough is key to preventing crust shrinkage during the blind baking.) Preheat the oven to 375°F. Blind bake the pie crust for 20 minutes. Remove from oven and let cool. Remember that mandolin? It’s time to use it again! Peel and wash the carrots. 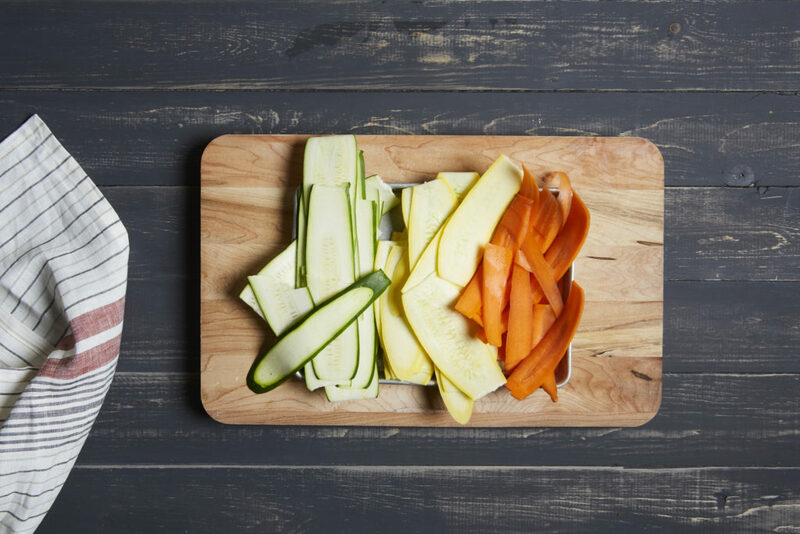 Cut the carrots, yellow squash, and zucchini into long, paper-thin slices. Transfer to a pot of boiling water and cook until flexible (about 3 minutes, depending on the type of vegetable, thinness of slices, and freshness of vegetable; check after a minute.). Don’t skip the boiling step, the vegetables need to be slightly soft and flexible in order to be rolled into the rose-like shape. While the vegetables are cooking, make the quiche filling: Combine eggs, cream and Parmesan in a medium bowl. Whisk together to fully incorporate. Season with salt and pepper then set aside while you roll the vegetables. Assembly works best if all the vegetables are rolled before arranging. I used a small rimmed baking sheet, but any pan with a rim will do. Just make sure you have ‘holding area’ for the vegetables close to your work area. To start the blooming vegetables, arrange two slices of the same vegetable lengthwise, slightly overlapping each other. Use a paper towel to blot any excess water. Starting at the end closest to you, gently roll the vegetables. Carefully transfer the rolled vegetables to your holding area. Repeat rolling the vegetables, until you’ve created about 45 rolls. Preheat the oven to 375°F. 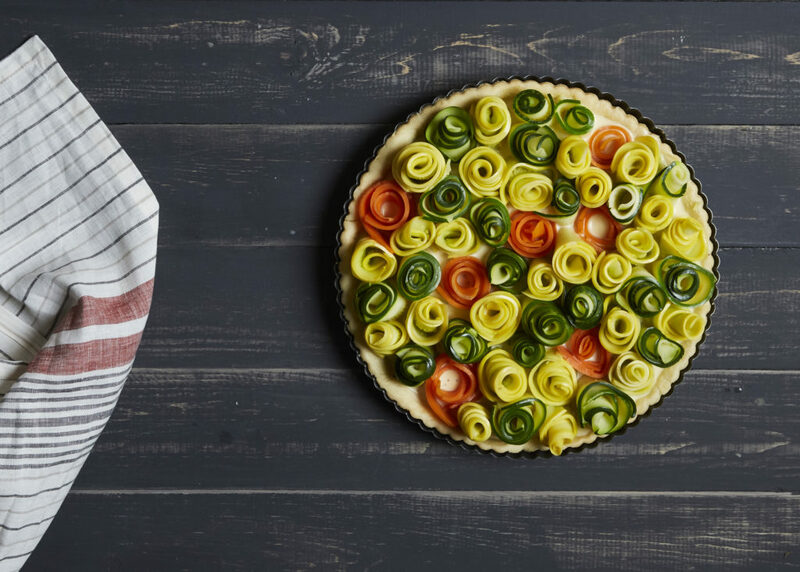 Pour the quiche mixture into the par-baked pie shell, then transfer the prepared vegetables rolls to the pie shell, starting around the crust and working inwards. Season the quiche with salt and pepper. Bake until the eggs have set and the vegetables have cooked and their tops start to brown, about 45 to 50 minutes. Remove from oven and let cool 10 to 15 minutes before serving. This article was first published on the MarthaStewart.com Network on January 27, 2017. They’re easy to make for an edible gift or an impressive party dessert. 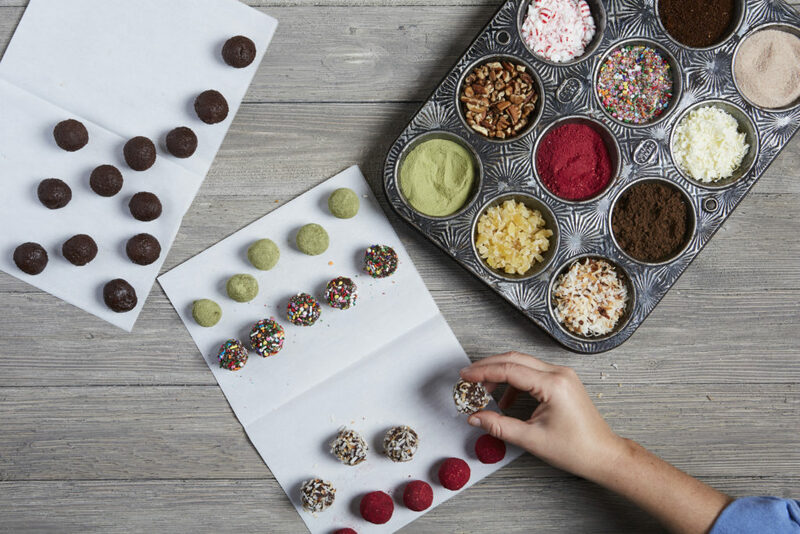 Not only are they easy to make, chocolate truffles just might be one of the most versatile confections for flavor customization. Here are a dozen different coatings you can use to add unique flavor to every chocolaty bite. 1. Matcha (green tea powder): Coating chocolate truffles in matcha gives a rich herbal green tea flavor. And the vivid green color gives these truffles a stunning look. 2. Pecans: Finely chopped pecans will add a buttery, nutty crunch to every little bite. This simple coating is one of my personal favorites. 3. Peppermint: In my house, peppermint is to chocolate what jelly is to peanut butter. Rolling a chocolate truffle in crushed peppermint candies is a great way to have that chocolate-minty combination we’ve all grown to love! 4. 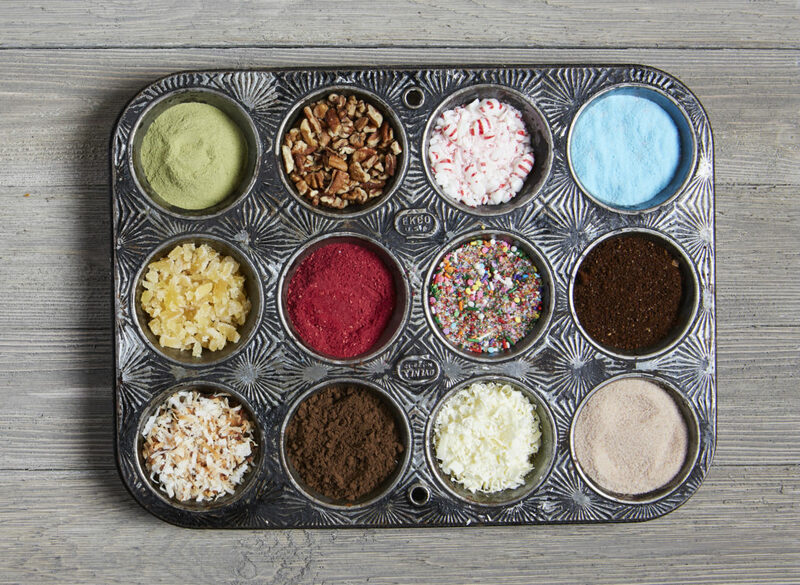 Pixy Sticks: Let your inner child loose and coat your truffles in pixy powder! I used blue pixy sticks and the result was excitingly colorful, rich, and tangy. 5. Ginger: There is nothing quite like the sharp spice of ginger. I finely chopped crystallized ginger then pressed it into to the truffles. The small pieces adhered to the truffles quite nicely. Crushing up hard candied ginger would work well too. 6. Raspberry: Pulverizing freeze-dried raspberries into a powder provides a perfect coating for chocolate truffles. The flavor is divine and the rich red color really makes these treats stand out. 7. Sprinkles: Nothing screams fun more than sprinkles! The mixture of color and texture adds a lot of character and crunch to these chocolate treats. 8. Espresso: Perfect for the coffee lover, rolling truffles in espresso adds a bold flavor. 9. Coconut: Finely chopped toasted coconut adds a tropical sweetness to chocolate truffles. 10. Cocoa and Chili Powder: Many truffles are simply rolled in cocoa powder, I added a few pinches of chili powder to the cocoa, which give this coating a touch of spice. 11. White Chocolate: Perfect for the chocolate lover, the contrast of white chocolate shavings makes these truffles really standout. 12. Cinnamon Sugar & Cayenne Pepper: The heat is on with this truffle coating. Adding a few pinches of cayenne pepper to cinnamon sugar will make these truffles taste like Mexican hot chocolate. Chocolate truffles are made from a simple ganache, a combination of milk and cream. 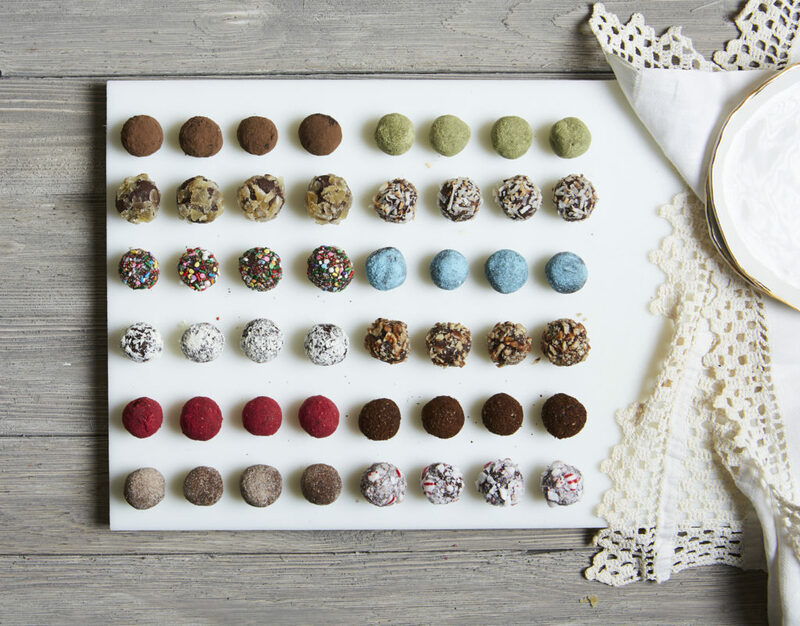 Martha’s Bittersweet Truffles is a perfect base recipe to make and then try all of these coatings! 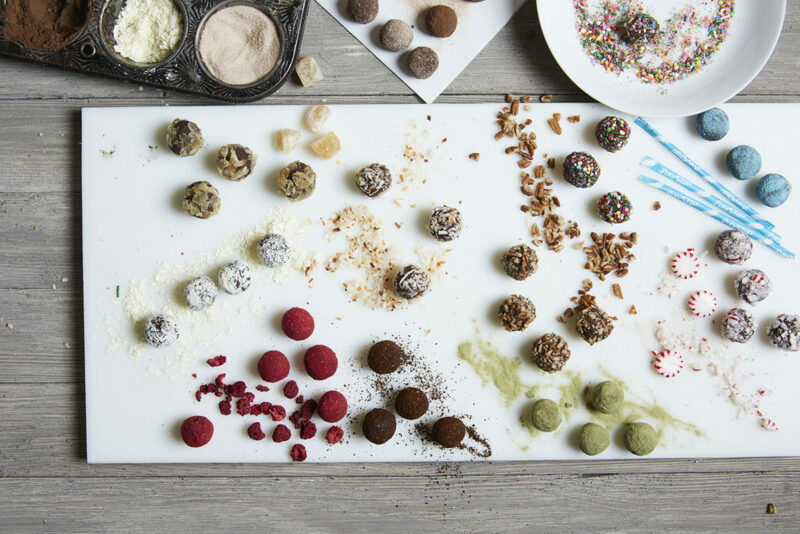 Once you’ve rolled the chocolate truffles into balls, simply drop the balls into your desired coatings, gently pressing to cover completely. Return the refrigerator and chill for about 30 minutes or until truffles are firm again. The truffles are the best served at room temperature, so take them out of the refrigerator. Give this recipe and coatings a try. I promise everyone who tastes them will be very, very pleased. This article was first published on the MarthaStewart.com Network on January 6, 2017. We are officially entering fruit season, which means juicy local berries galore. 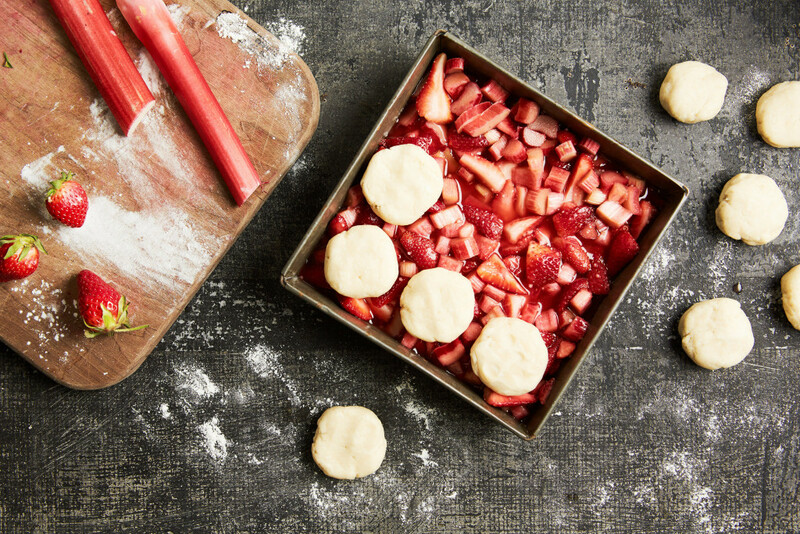 Fresh fruit ready to be cooked and filled in flaky pastry is a spring and summer staple in my home. 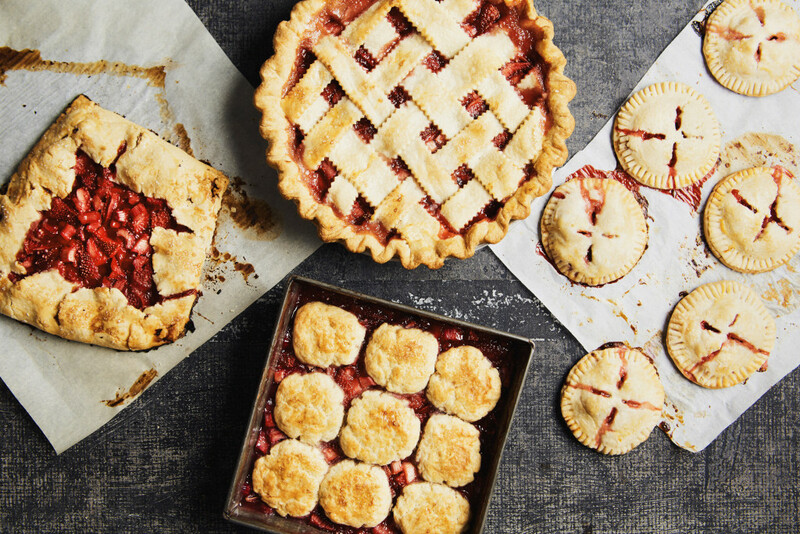 Of course I love making pie, but that’s not the only way to showcase seasonal fruit; there are many other ways to make delicious pastries using the same pie filling. 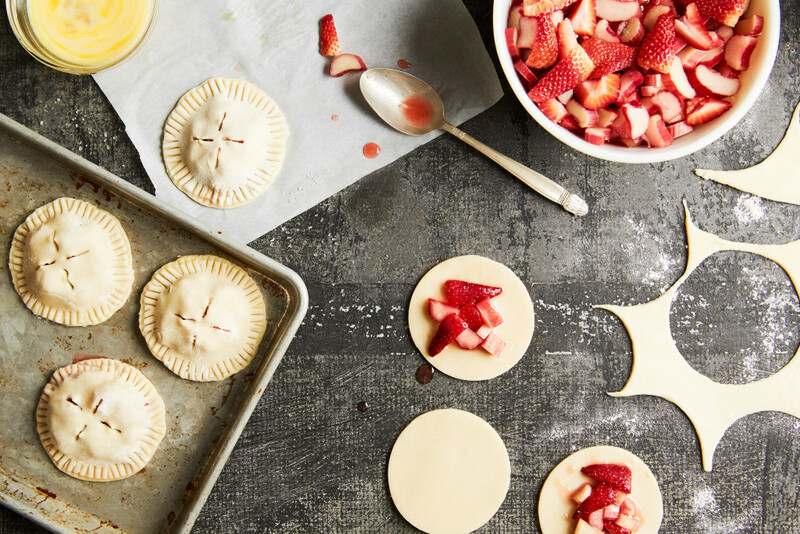 I used the filling from Martha Stewart’s Rhubarb-Strawberry Pie for my four desserts here, but pretty much any fruit-based pie filling will work. No pie plate? No problem. 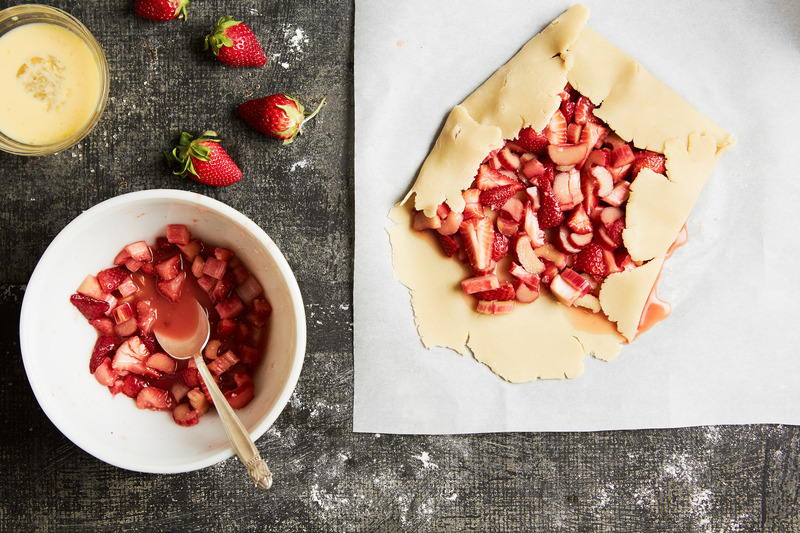 Use your fruit filling to make a rustic French-style galette. For this pastry you may not use all of the prepared filling, and you will only need dough for a single crust pie. 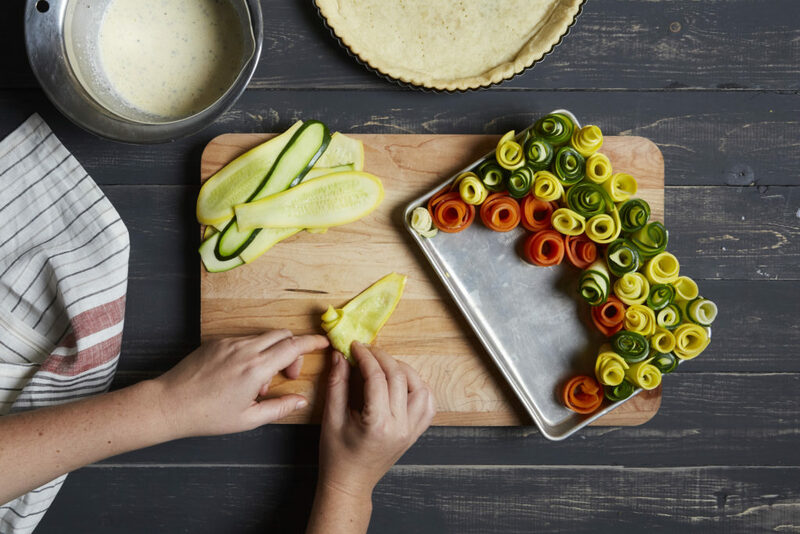 Roll out your pastry dough in a large circle on a sheet of parchment paper, then place the filling in the center and fold over the crust. Transfer to a baking sheet, brush with egg wash. sprinkle with sugar, then bake at 375 degrees until juices in the center are bubbling, about 50 to 60 minutes. 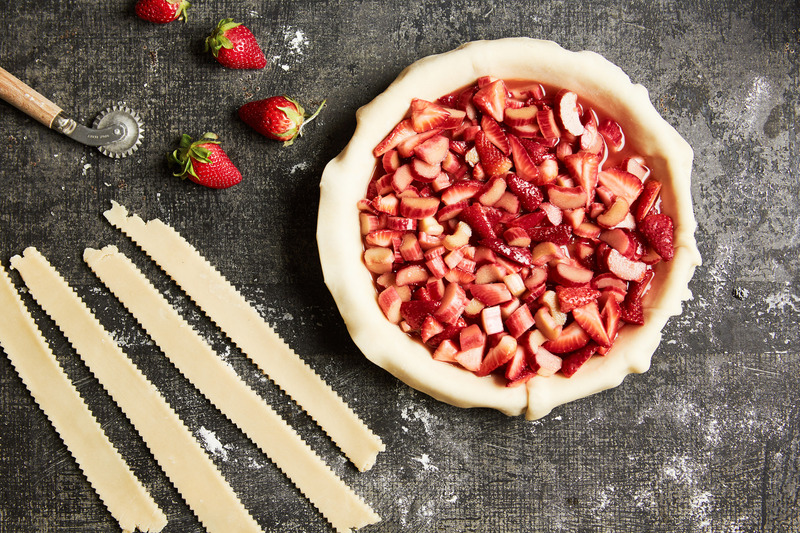 Probably the most obvious way to use your filling is to make a delicious pie with a flaky lattice crust. 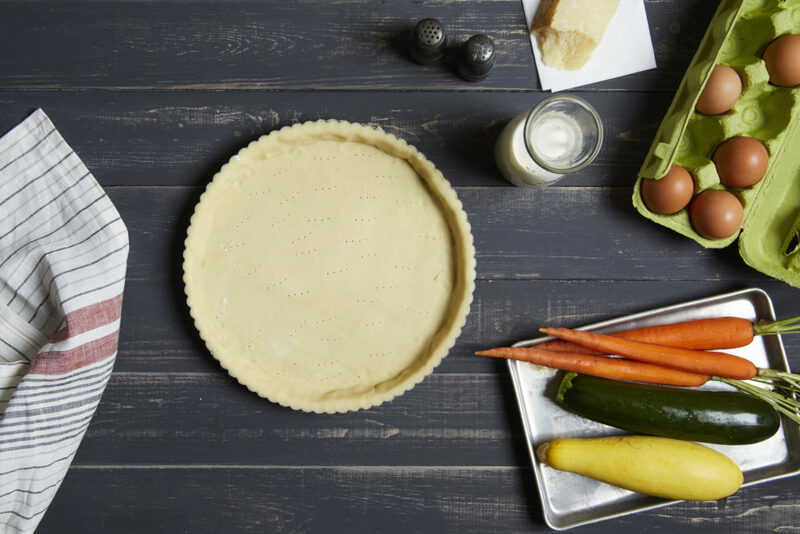 In addition to the filling, you will need dough for a double-crust pie. Once the pie is filled, lattice the top. Trim the edges then fold and crimp the crust. Brush with egg wash, sprinkle with sugar, then bake at 375 degrees until juices in the center are bubbling, about 90 minutes. These hand-held pastries are portable and delicious and one of my favorite things to make for parties. They do take the most time in terms of prep, but these sweet little treats are worth the effort. To make hand pies, in addition to the filling (you will likely only use about half the quantity needed for a regular pie), you’ll also need dough for a double-crust pie. 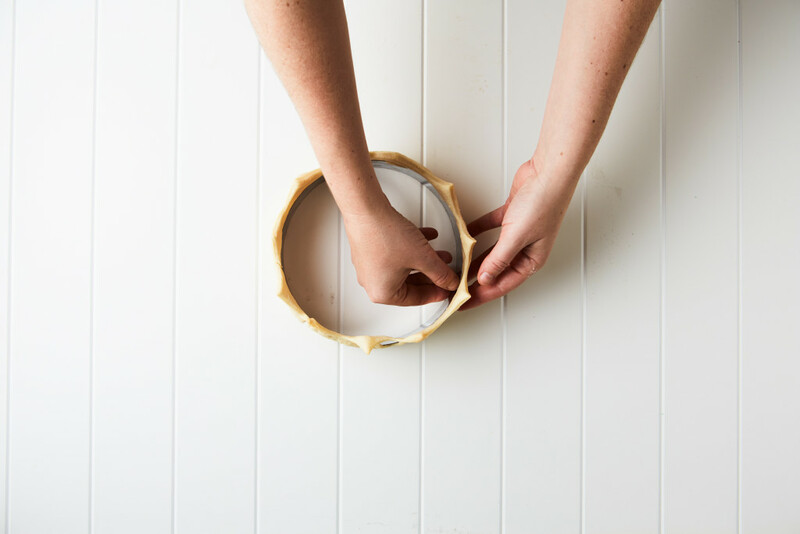 Roll the dough out, then use a large biscuit cutter to cut circular disks. Brush each of the disks with egg wash, then spoon filling into the center. Top with a second dough circle to fully enclose the pie, then press to seal the edges. I used a fork to press in a decorative crust design. Cut small air vents into the top, then brush with egg wash and sprinkle with sugar. Repeat the process with all the hand pies. Transfer to a parchment lined baking sheet, then bake at 375 degrees until juices in the center are bubbling, about 40 to 50 minutes. Skip the traditional pie dough and make a cobbler! It calls for biscuits to top the fruit filling. I used the biscuits from Martha Stewart’s Best Berry Cobbler, and they worked perfectly. Place the filling in a deep baking dish, then top with biscuit dough. Brush biscuits with melted butter, sprinkle with sugar, then bake at 375 degrees until juices in the center are bubbling and biscuits are golden, about 45 to 55 minutes. Which style of pastry suits your fancy? Give them all a try; it’s easy to make a delicious dessert with your favorite fruit pie filling. This article was first published on the MarthaStewart.com Network on May 26, 2016. 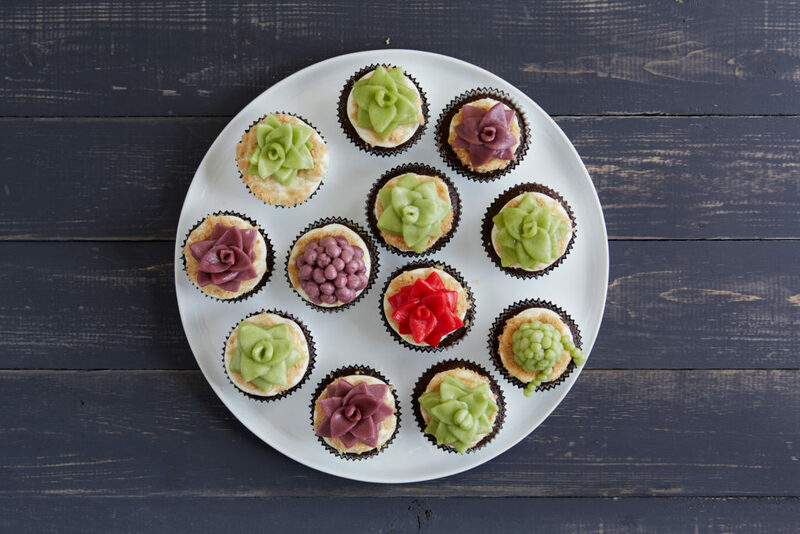 Use these super-quick and simple decorating ideas to transform your cupcakes into spring cupcakes. Fresh fruit, flowers, herbs, and even leftover Easter candy will give your treats a seasonal look. 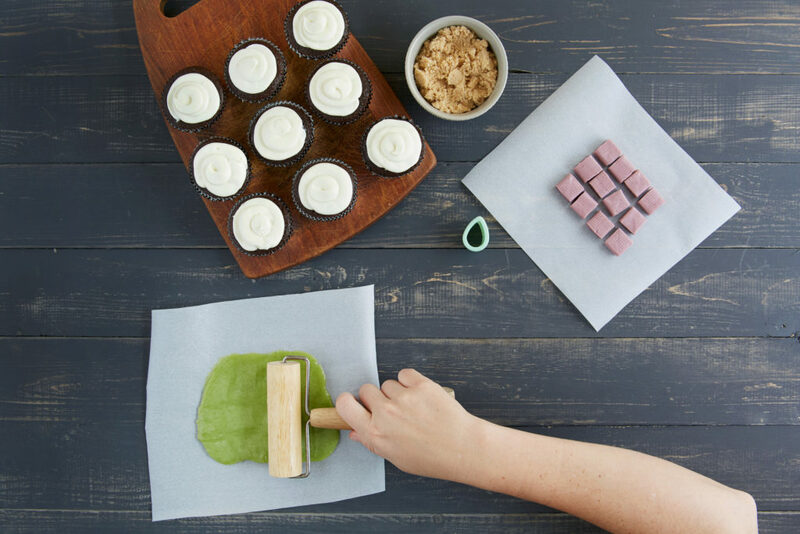 From the batter to the frosting, there are so many ways to flavor cupcakes. 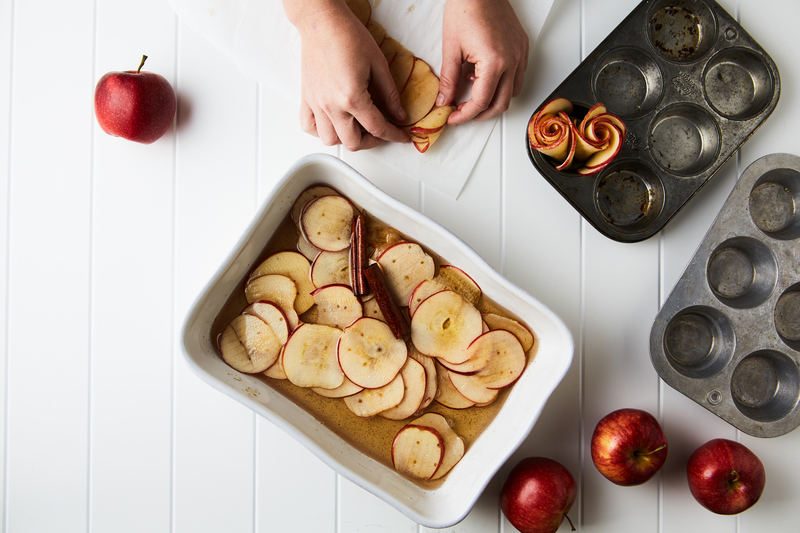 Baking to the season is a good excuse to try a new recipe. For spring cupcakes strawberry cupcakes or lemon cupcakes are a couple of great options. When it comes time to add the beloved buttercream, I always recommend piping it on the cupcakes. Like mastering most things, using a pastry bag takes practice. But cupcakes are a great place to start. (Remember, if you mess up the piped design, it’s easy to scrape it off, refill the bag and start over.) 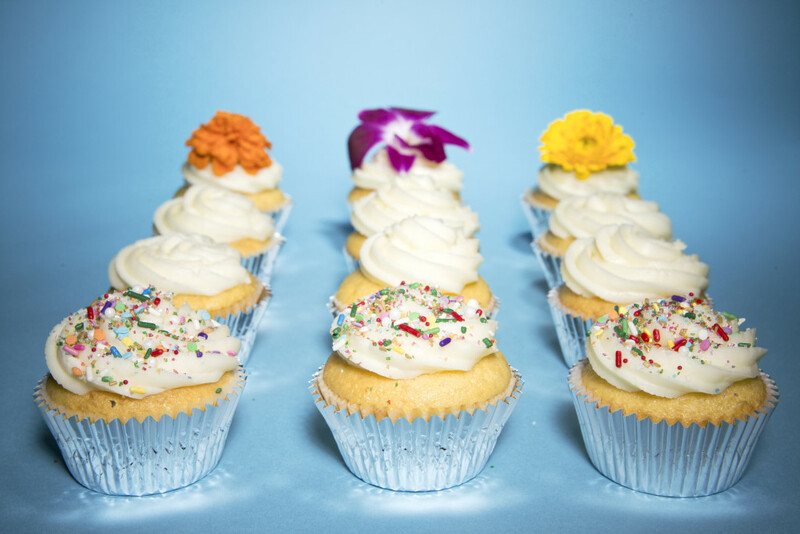 I like to use a large star-shaped tip to frost cupcakes because it creates a clean floral look. 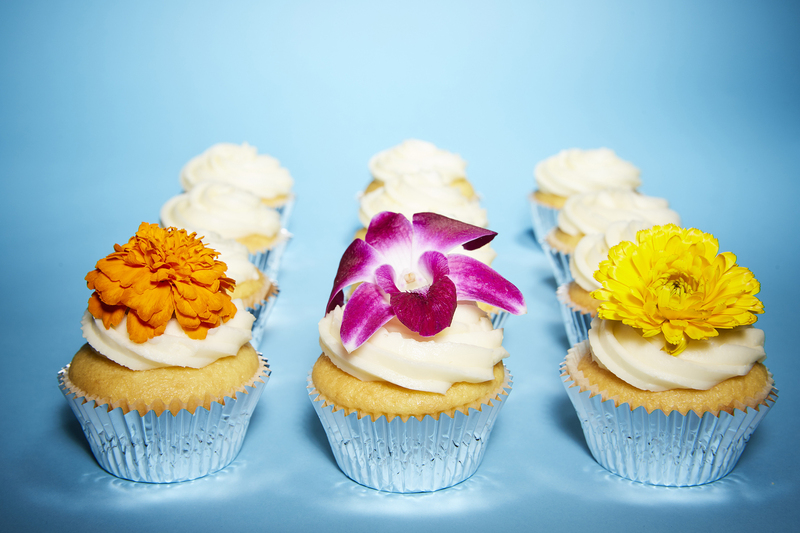 Once your cupcakes are frosted, here are some spring-time toppers you can try. 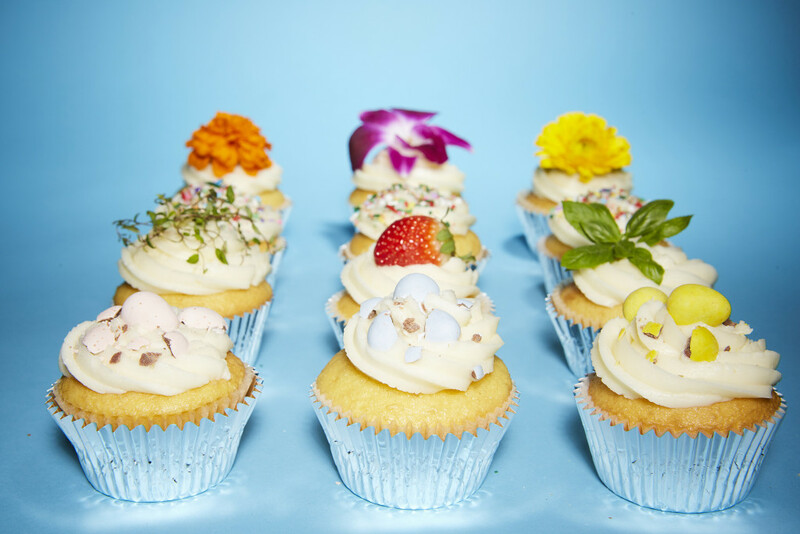 Adding a beautiful bloom to the top of your cupcake takes minimal effort and has an amazing visual wow-factor. I used edible flowers, but you can snip a few buds from your garden: just be sure to let those who are eating the cupcakes know that the flowers are for decoration purposes only. 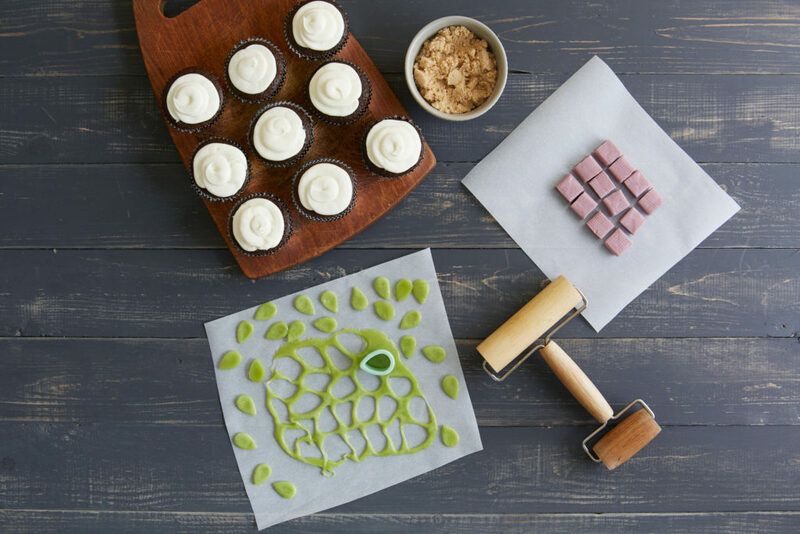 Perhaps sprinkles are an obvious choice for cupcake toppers, but they are always an excellent (and easy) option. They come in so many shapes, sizes and colors, I like to keep a variety on hand for all occasions. Plus it’s fun to mix and match different sprinkles. For a spring-time look, I used a variety of bright colors and different shapes. I’m a big fan of using herbs and fresh fruit in pastries, and adding a herbal note doesn’t always have to be n the batter or the frosting. 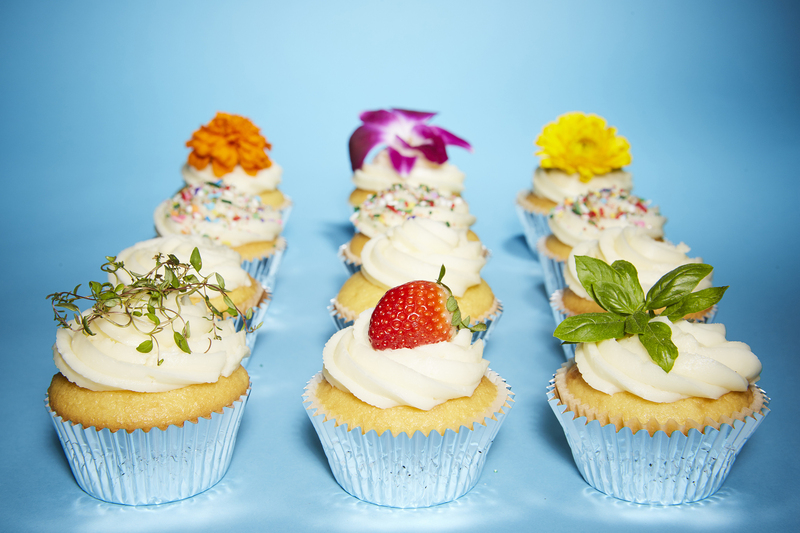 Using a few herb sprigs as a topper can bring a whole new dimension to your spring cupcakes. I particuarly love using sweet basil and thyme. Fresh fruit like strawberries, or even blueberries or blackberries, are another great option. 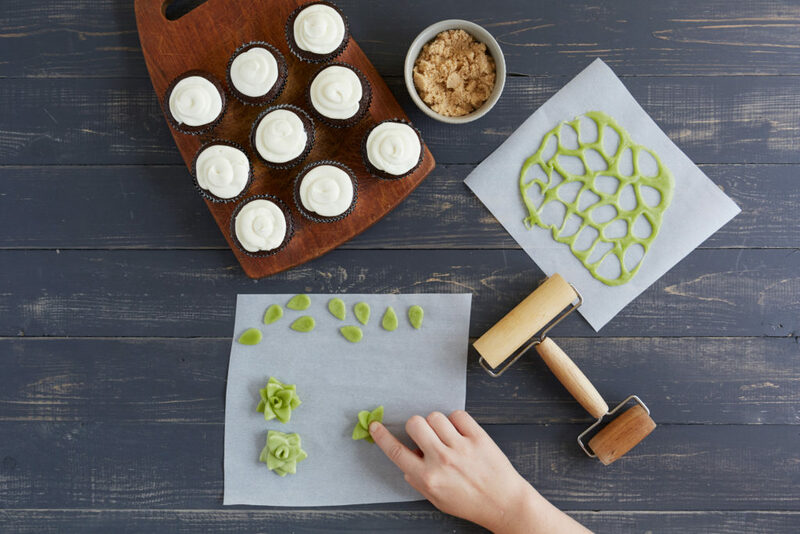 No matter what you chose, these unexpected spring cupcake toppers will delight your family and guests. Easter candy seems to linger for months at my house. 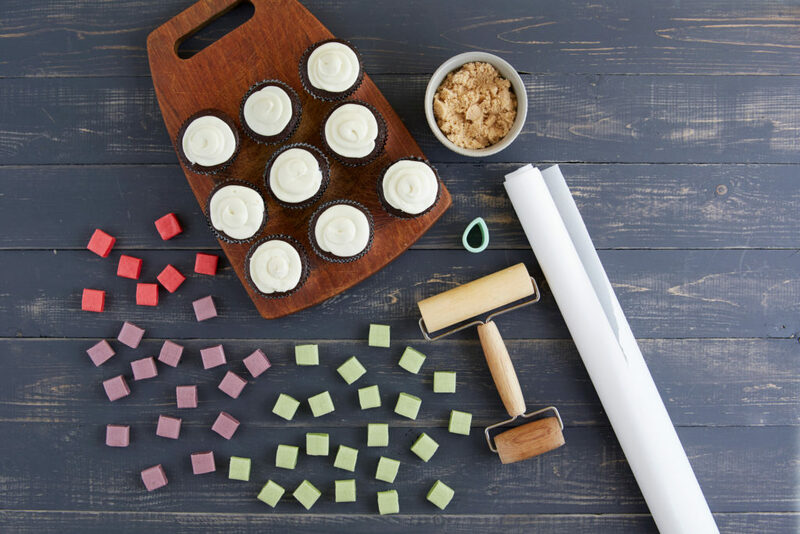 Adding it to cupcakes in lieu of sprinkles is a fun and colorful option. If you still have remaining pastel candy stashed away, add it whole or crush it up and sprinkle on top! This article was first published on the MarthaStewart.com Network on April 29, 2016. What’s better for a spring celebration than an egg-shaped Easter cake? Bake your favorite cake recipe then transform it into an egg with these easy steps. The finished cake, decorated with vibrant colors and pastel candy is both a gorgeous centerpiece and deliciously festive dessert. 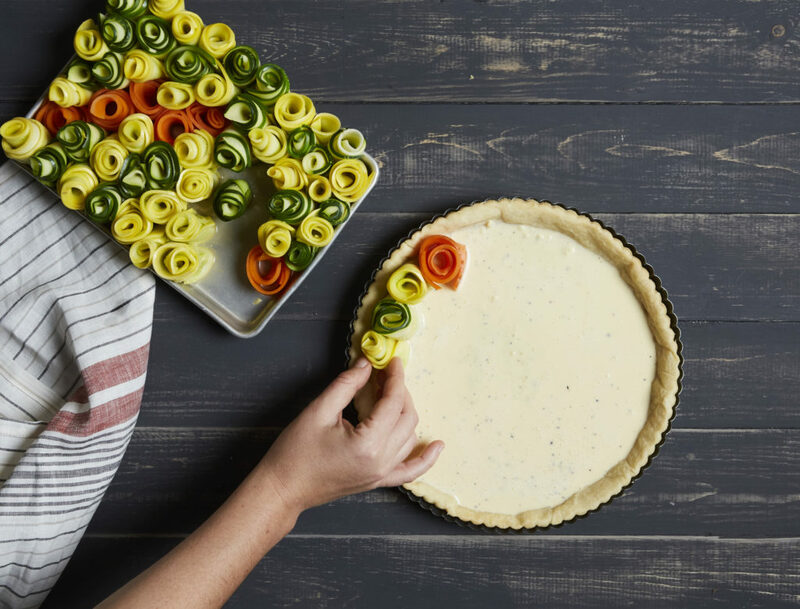 For this project all you need is: a square and a round cake pan, icing spatulas and a piping bag with an assortment of tips for decorating the cake, and a large serving platter — oval works best. Use a cake recipe that makes a two-layer cake. I used Martha Stewart’s Simple Layer Cake. A pastel cake would work wonderfully too. 1. Prepare the cake batter following the recipe instructions. 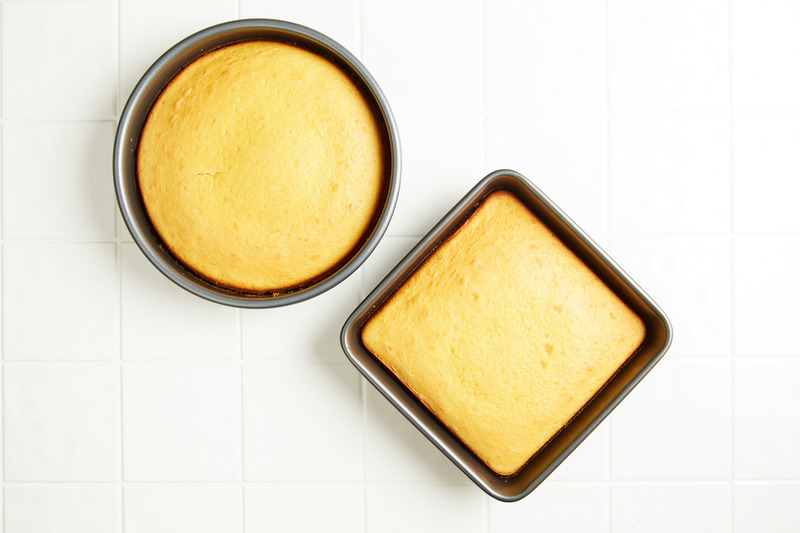 Divide the batter evenly between one 9 x 9 x 2-inch square baking pan and one 8 or 9-inch round cake pan. Bake and cool the cakes according to the recipe instructions. Remove cakes from the pans and let cool completely before cutting — trimming a warm cake can be a very crumby disaster! 2. 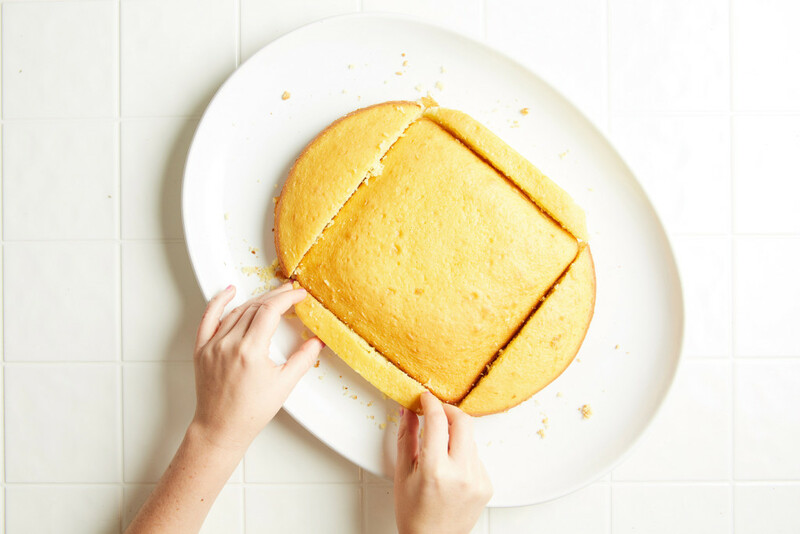 To start assembling the Easter cake, place the square cake in the center of the platter. Next, cut each end of the round cake so that it sits flush against the square cake. Place the half-rounds on either end of the square cake to create an egg shape. (Note: You will not cut the round cake in half, but rather each end separately, with some cake remaining in the center). Use the remaining cake scraps from the center of the round cake to fill out the top and bottom of the cake, creating an egg shape. Oh, and don’t worry if your Easter cake looks a little messy, the frosting in the next step will hide that! 3. Now it is time to start frosting the egg cake. 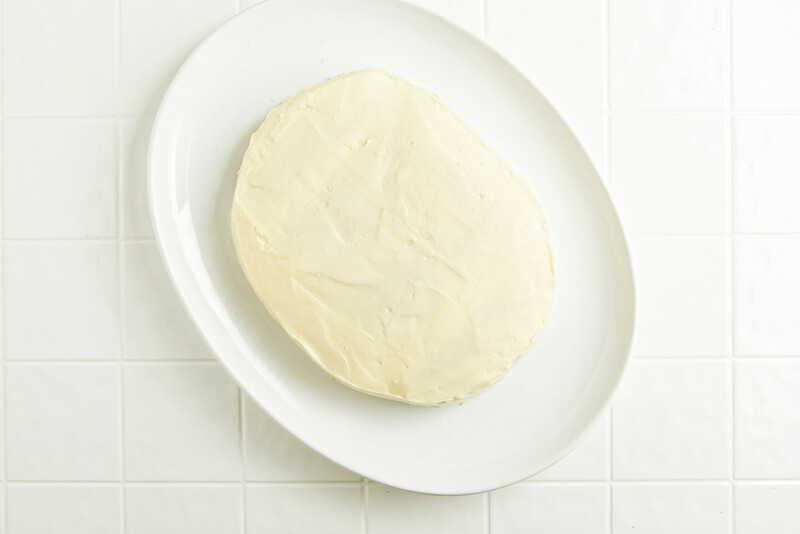 Martha Stewart’s Basic Buttercream is really great for this project, but most white or pale colored frosting will work. You could tint your frosting if you want a more vibrantly colored egg cake. Make it pink, yellow green or blue – whatever color you fancy! Use a pastry bag fitted with a large tip to pipe a little of frosting on to the seams of each of the cake pieces to ‘glue’ them in place. Then, use spatula to frost the entire cake. Smooth the tops and the sides of the cake and transfer to the refrigerator for 10 to 15 minutes to firm up the frosting before you start decorating. 4. Get creative! 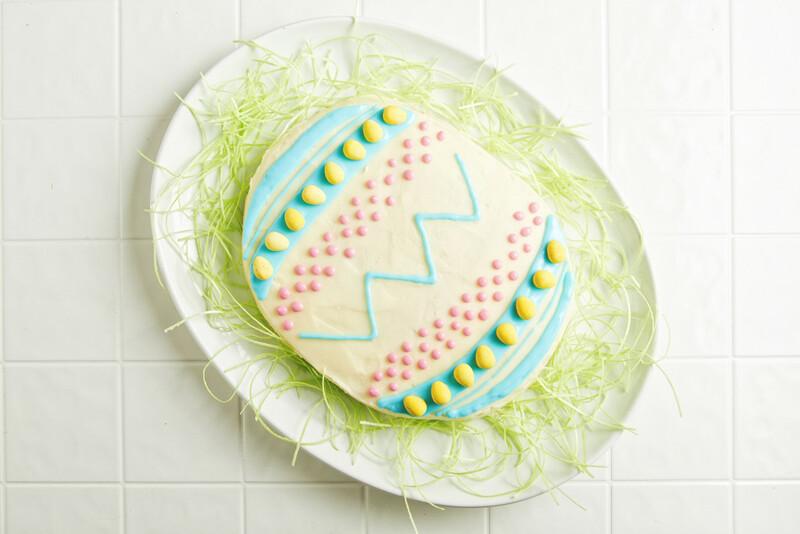 You can decorate your Easter egg cake however you like. It’s a fun project for kids to help with. I used pink and blue colored icing, piped on with a small circular decorators tip, pastel colored candy eggs and edible Easter grass. The Easter egg-shaped cake can be refrigerated, just be sure to bring it to room temperature before serving. This article was first published on the MarthaStewart.com Network on March 23, 2016. Dessert should be as sweet and beautiful as your special someone, especially on Valentine’s Day. Try this extra-special apple pie recipe — you’re in for a treat! Last year I made mini versions of this pie, but after many requests, I decided to create a full-sized version. It’s a bit more labor intensive, but the end result is well worth the effort. 1. Prepare the pie dough as instructed. Once it’s ready, roll it out on a lightly floured surface. Then, transfer it to a 9-inch pie dish. Crimp the edges and prick the bottoms and sides with a fork. Cover with plastic wrap and refrigerate for 15 to 20 minutes. Chilling the dough is key to preventing crust shrinkage during the blind baking. Preheat the oven to 375 degrees. 2. Because the apple slices will be paper thin, they won’t take long to bake, so you will need to blind bake the pie crust: Line the pie shell with parchment paper, then add ceramic or metal pie weights (dried beans also work). Bake for 20 to 25 minutes or until the crust is golden. 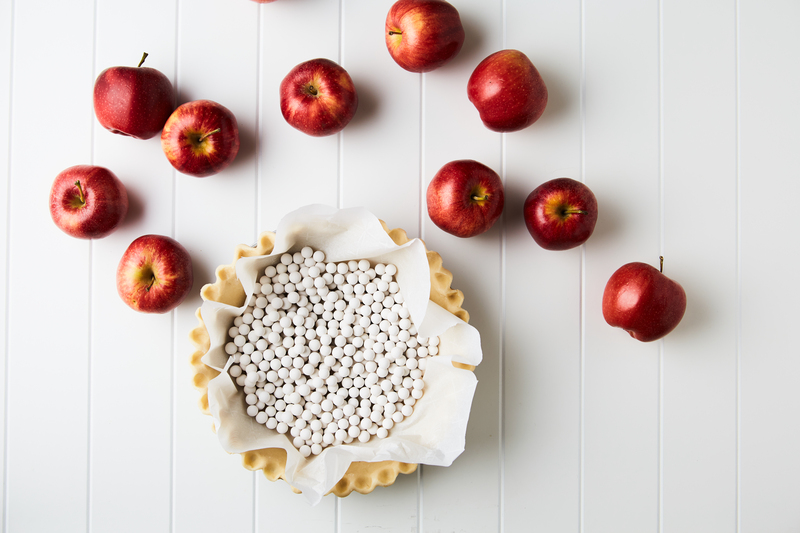 Remove the parchment paper and pie weights, then set on a wire rack to cool. 3. Prepare about 3 cups of simple syrup. I added vanilla and cinnamon sticks to mine, but you can flavor however you’d like. Once prepared, pour the hot syrup into a 9-by-13-inch dish and set aside. It’s time to get out the mandolin again! Using a knife, cut off each end of an apple lengthwise (to remove the core and maintain a flat surface). Cut apple into paper-thin slices. Transfer to the syrup and let soak for at least 10 minutes. Repeat with remaining apples. 4. 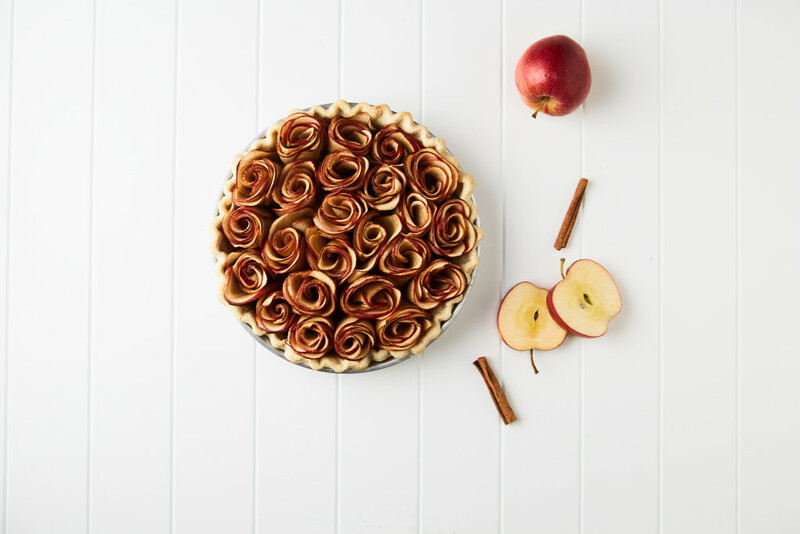 In the full-sized version of this pie, the apple roses will use each other to stay in the spiral shape. You will need to prepare all of them before arranging them in the pie pan. Muffin tins work perfectly as a ‘holding area’ for your finished roses. Place a muffin tin near your work station before you get started. To start the apple roses, arrange 7 to 8 apple slices lengthwise in a straight line, overlapping each other on a piece of parchment paper. Blot juices with a paper towel. Starting at the end closest to you, gently and tightly roll the apples. Try not to stop once you have started to roll. Carefully transfer the rolled apple rose into the muffin tin. 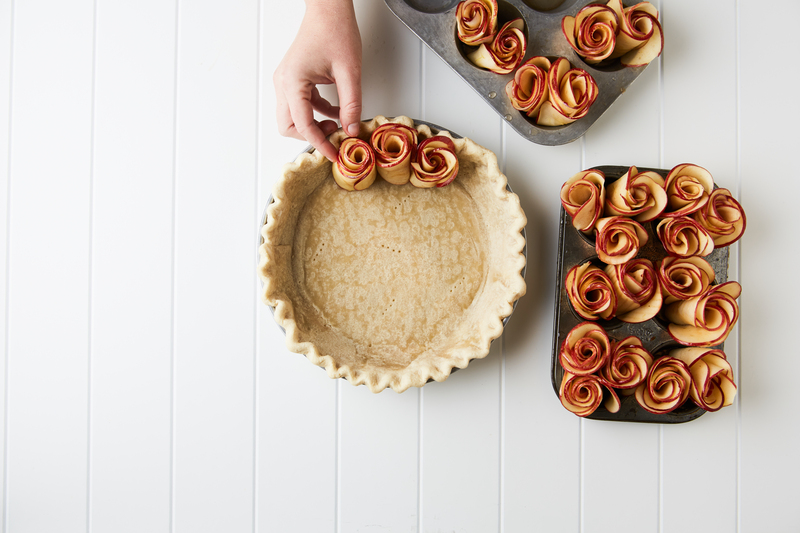 Repeat rolling apples, until you’ve created 24 apple roses. 5. Preheat the oven to 350 degrees. Dust the bottom of the pie shell with a bit of flour (to help absorb any juice drippings), then transfer the prepared apple roses to it. 6. Sprinkle the finished pie with sugar. 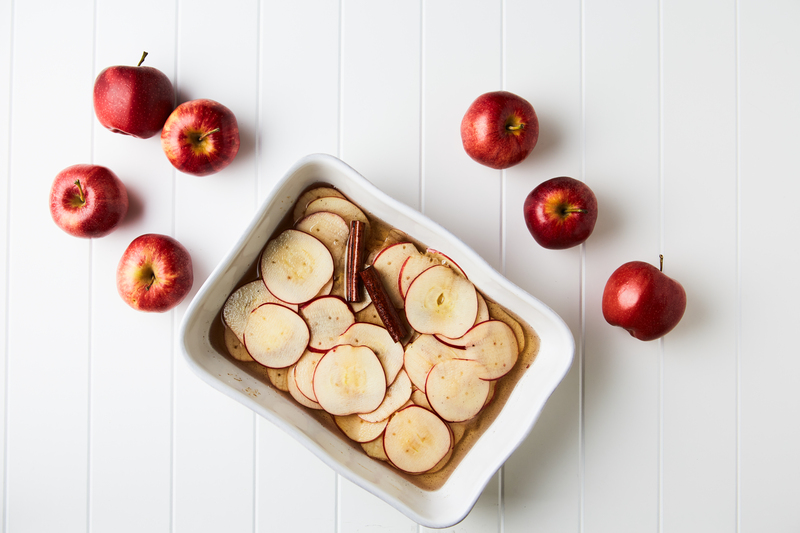 Put in the oven and bake until the apples have cooked and the tops start to brown, about 25 to 30 minutes. 7. Let cool completely before serving. This article was first published on the MarthaStewart.com Network on February 5, 2016. 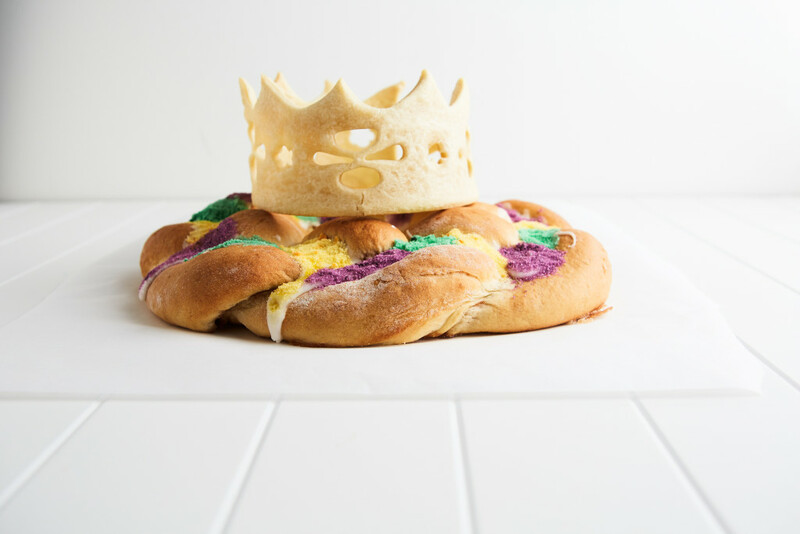 A king cake is a once-a-year treat! 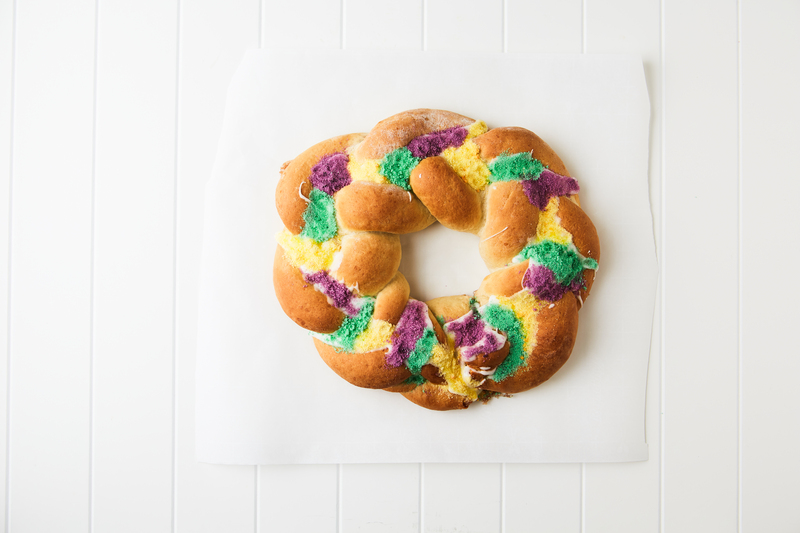 Here’s how to add a buttery, flaky pastry crown to your Mardi Gras king cake. 1. To start the crown, you’ll need to first measure the circumference of your cake ring. I used a 6-inch cake ring as the crown mold, which was about 21 inches. 2. 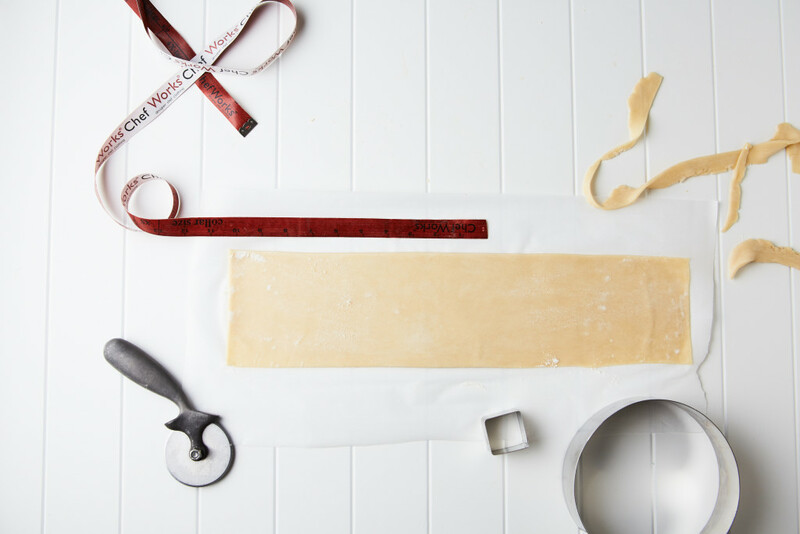 On a piece of parchment paper, roll out your pie dough into a long rectangle the length of the circumference you just measured (in my case, 21 inches) and about 4 inches wide. Use a knife or rolling cutter to trim the edges. Discard the scraps. 3. Next, create the crown arches (the points). You can use a square cutter, knife, or rolling cutter. I used a small 1 1/2-inch square cookie cutter, which helped create symmetrical consistency. 4. Now create a decorative, cut-out pattern on the crown. You can use cookie cutters or just go freestyle. I used small flower and petal shapes which worked perfectly, but nearly any cutter will do. 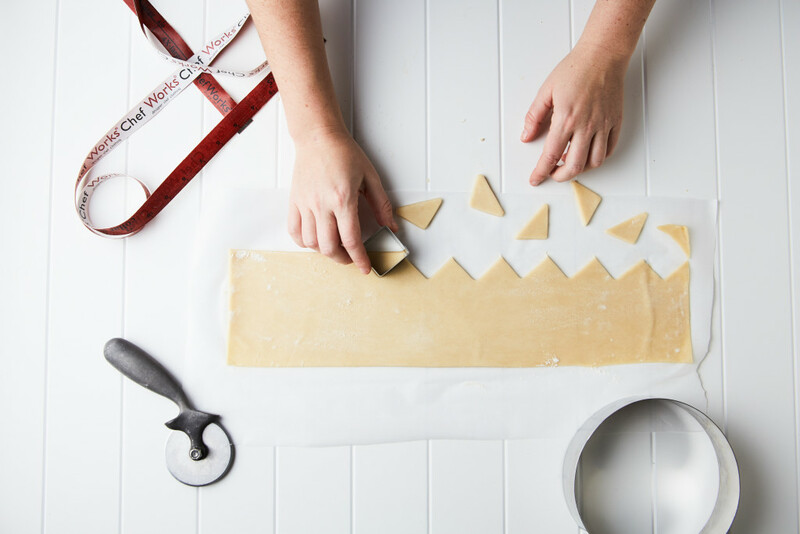 After you’ve completed your design, discard remaining pie scraps and transfer dough to the refrigerator for about 10 minutes. 5. Make sure the dough is firm but still pliable (so that it can be easily bent). Grease the cake ring with nonstick cooking spray, then carefully wrap the dough around the outside of it. Gently pinch the ends together to create a seam. Be careful not to press your dough into the cake ring — you don’t want the pastry to bake into it, just around it! 6. 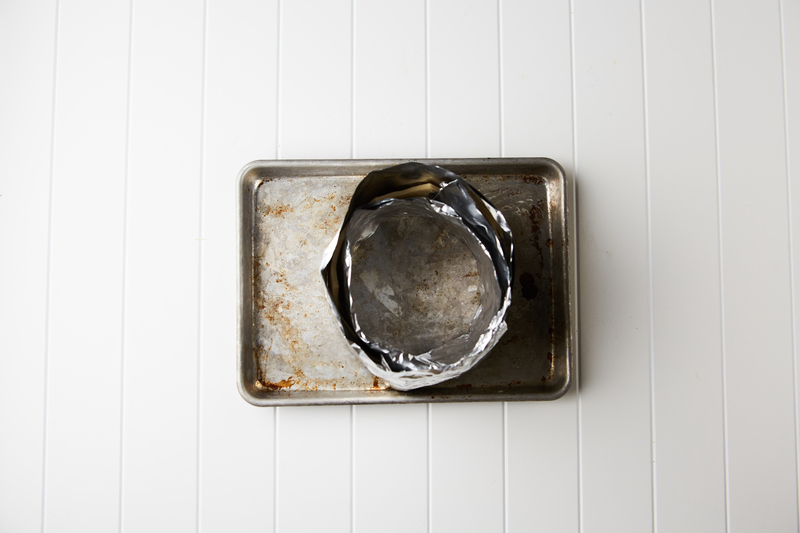 Wrap a folded, triple layer of aluminum foil around both the inside and outside of the crown. The foil will act as structural support during baking. 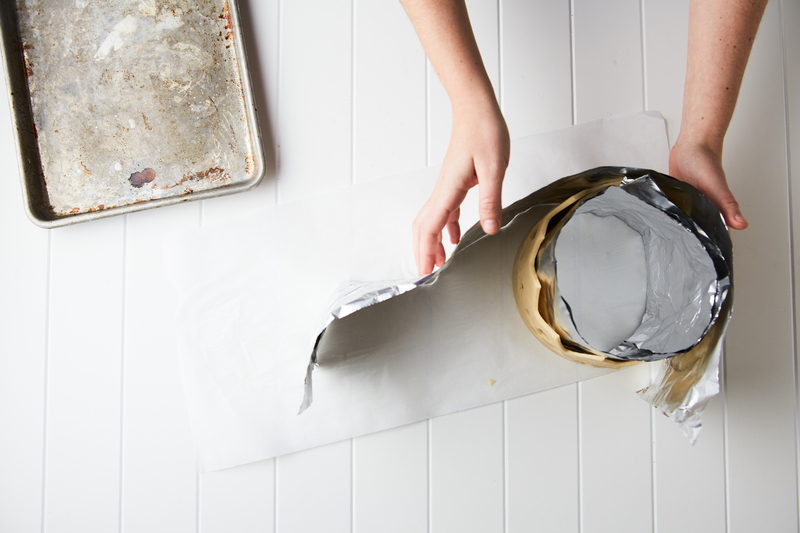 With foil on both sides, the pastry won’t flop over or fall during the baking. Be sure the foil is at least the same height or taller than the crown. Gently pinch together and fold the top pieces of foil. Place on a baking sheet, then transfer to the refrigerator or freezer for 15 to 20 minutes to chill. Preheat the oven to 375 degrees. Bake the crown until the pastry is golden, about 20 to 25 minutes. Discard the foil and let the crown cool completely. 7. The baked crown will be delicate, so be very gentle when removing it from the cake ring. 8. Voila! 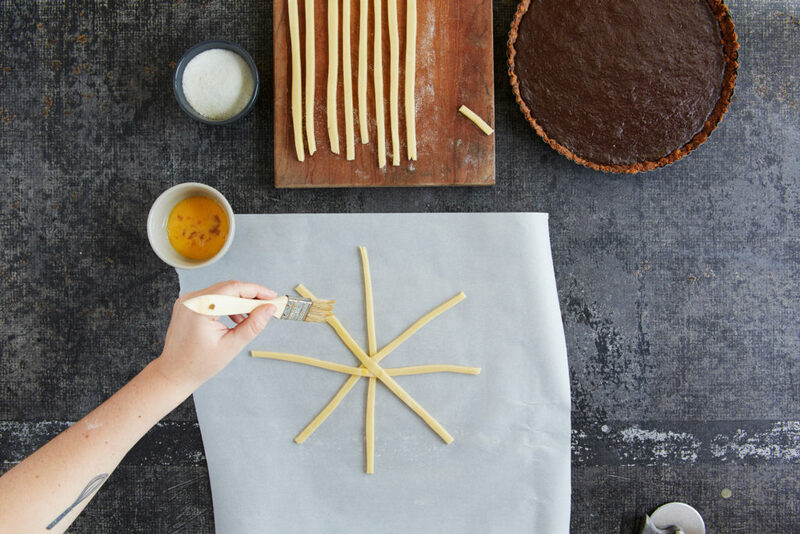 You have the perfect golden pastry crown. Place it on top of your Mardi Gras king cake before serving. This article was first published on the MarthaStewart.com Network on February 6, 2016.